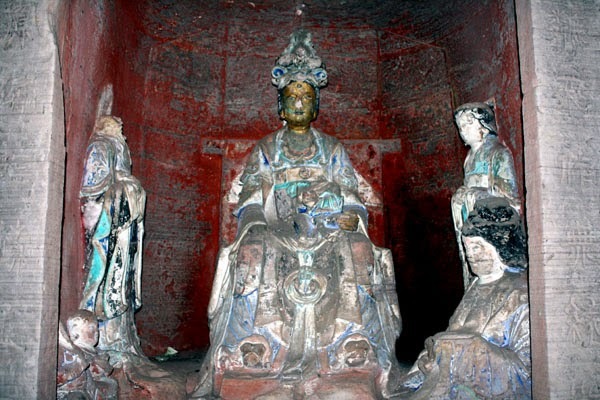 An elegant Buddha Triad (三尊佛) at Beishan Grottoes (北山石窟) near "downtown" Dazu, Chongqing (重庆, 大足). 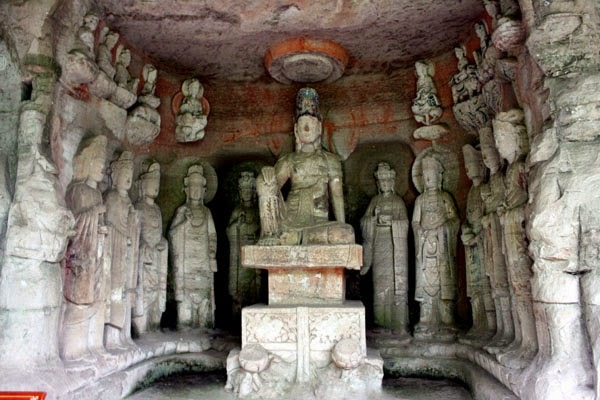 After the somewhat cartoonish figures at Baodingshan, I found the elegance of the next set of grottoes refreshing. 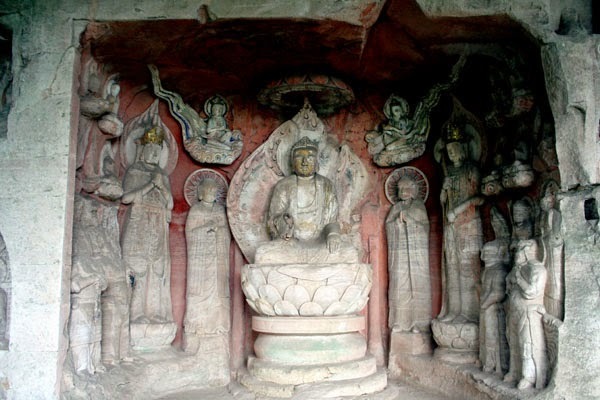 Beishan ("North Mountain") is just a couple of kilometers from the center of Dazu. It's so close, I took a taxi, which by happy accident dropped me at the wrong part of the complex. Instead of entering and seeing the grottoes immediately, I ended up climbing to a pagoda and seeing a couple of good-sized carved Buddhas. There was also a funky little "Three Buddha Hall" there, with a single old monk sleeping inside. On, then, to the UNESCO-worthy site. The statues here have a delicate reality that rivals the best I've seen anywhere in China. 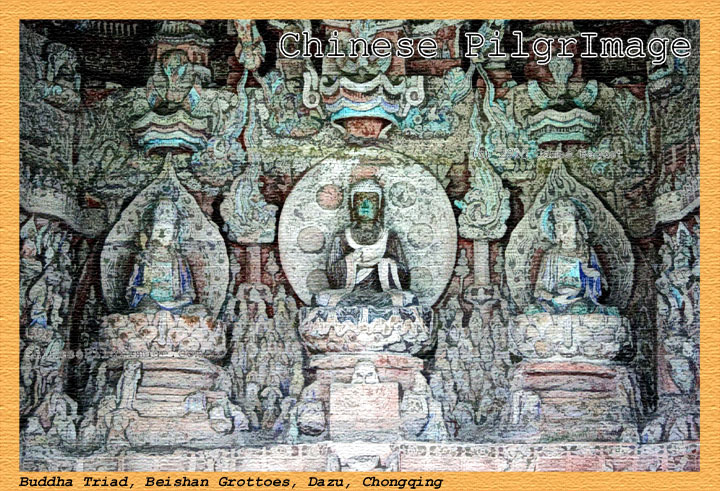 Large groupings predominate: Shakyamuni, the founding Buddha, surrounded by bodhisattvas, disciples, and angel-like apsaras; thirteen separate manifestations of the Bodhisattva of Compassion, Guanyin, all in one niche; Amitabha Buddha presiding over a fortress-like Western Pure Land, surrounded by souls who have been reborn there. These are just some of the assemblages. 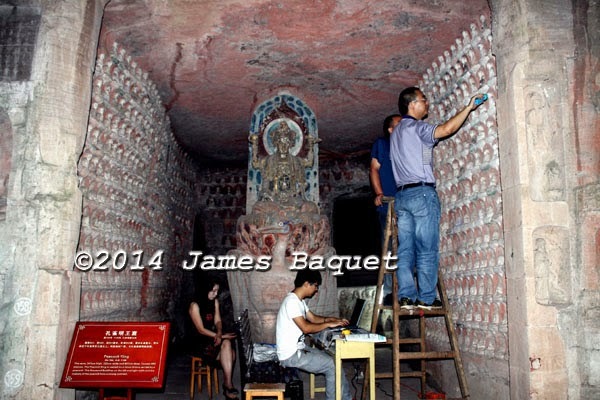 In addition there are individual representations of bodhisattvas, and whole walls of mini-buddhas. There is almost nothing whimsical in this site; the tone is primarily reverent. 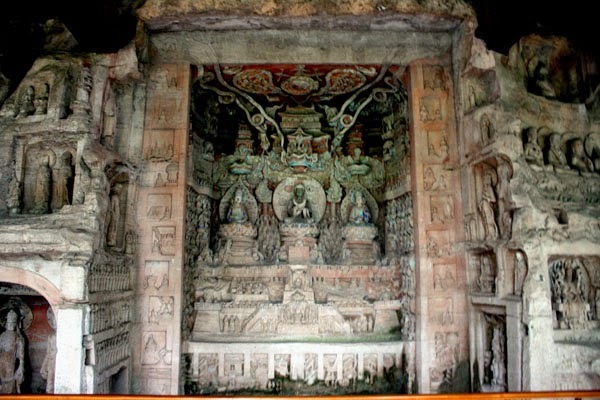 Some of Beishan's carvings are Dazu's oldest, having been begun in 892 by Wei Junjing, a military governor sent to the area to quell a rebellion. His image is one amongst the many at the site. An extensive stele carved in the wall next to the statue tells of his accomplishments. The more elaborate and extensive carvings in a 500-meter-long overhang are later, 12th-century, additions. Like the larger and flashier Baodingshan, this is a sight not to be missed. Conservators work on the "Peacock King"
There are 29 pictures related to this temple (some of them identical to these, but with different captions) in a FaceBook album starting here (available to all, even without a FaceBook account).